Such denunciations are not enough. Alienated minorities have to be helped to see that their extremist interpretation of scripture is wrong. This, of course, has to be the task of members of the particular religion – and it is good that Muslims are now making big efforts to do this and to play a full part in the interfaith movement. Yet they deserve support from people of other faiths, who need to make a wider public aware that the extremism that is highlighted by the media is not the true face of a religion. Otherwise all the members of that faith feel targeted and their sense of being marginalised, economically and politically, is exploited by extremists. Whatever our own beliefs we have a responsibility to resist Islamaphobia or anti-Semitism or the persecution of Christians. 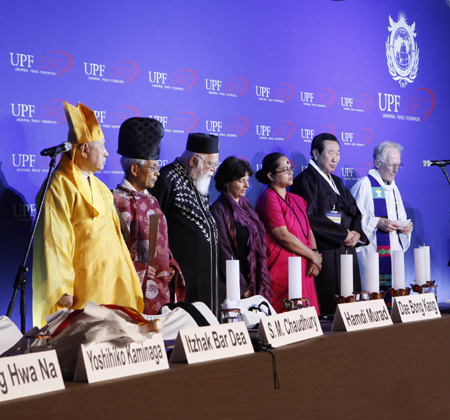 Interfaith understanding is also vital within a society – most European countries are now multi-racial and multi-faith and in many Muslim countries there are deep divisions between Sunnis and Shi’ites. Religion is part of a person’s sense of identity – what they wear, what they eat, as well as what they believe. It is important that minorities are free to practise their religion without discrimination and the majority community has a responsibility to defend minorities. Yet, besides respecting differences, if a society is to be cohesive, it needs shared values. In Britain for example in the past these have been provided by the established Church of England and more broadly by all the Christian Churches. Today the faiths need to come together to affirm those shared values, as they have done in the Global Ethic – values which are also shared with many people of good will. Together faith communities need greater confidence in the moral values that they share – not as one group trying to impose its beliefs on others – but because without trust and integrity a society implodes. The danger is that aggressive secularists have exploited multi-culturalismto create a-moral societies. Because something is fashionable it does not make it right. This, I believe, is a root cause of the banking crisis and in Britain the loss of confidence in members of parliament, the press, care homes, the police, sport and the church – although it is only a minority in each institution that are untrustworthy. In some countries the moral vacuum makes possible high levels of corruption and in other places the violation of human rights. Of course, I also believe that trust in God’s goodness and mercy enriches our personal lives as well as contributing to happy family life. Rev. 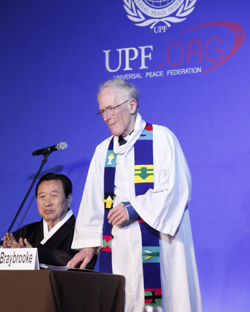 Dr. Marcus Braybrooke DD., is a retired Anglican Clergyman. He was Executive Director Council of Christians & Jews 1984 - 87, and Chairman of the World Congresses of Faiths 1978 - 83 & 1992 - 99, and is its current President. He is the author of more than a dozen books. His Lambeth Doctor of Divinity was presented by the Archbishop of Canterbury in recognition of "his world-wide work for inter-religious understanding and co-operation."